Are your summer tomatoes coming on right about now? My five year old found our first one in the garden yesterday, and we all took a bite of its juicy sweetness. 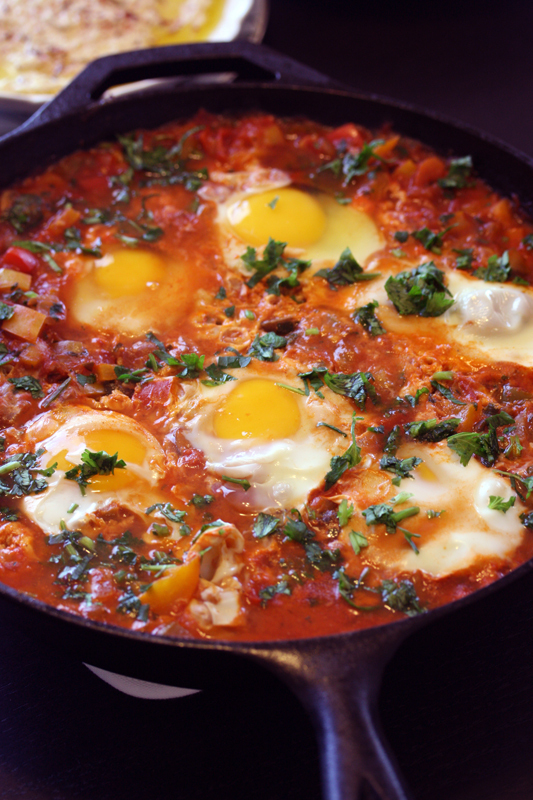 And if you have eggplant, or can come across a few, then it’s definitely time for Shakshuka! My husband brought this dish home years ago after traveling with Israeli friends. So we have always thought of it as Israeli. It’s been a staple breakfast whenever we have an abundance of tomatoes and eggplants. However, according to my gorgeous new cookbook (Jerusalem: Ottolenghi & Tamimi, 2012) it is originally Tunisian. 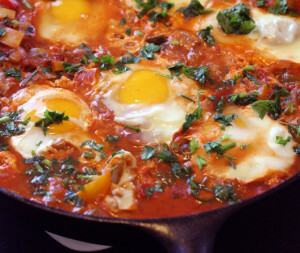 Whomever thought it up, it’s a divine combination of flavours in a tomato/eggplant sauce with eggs on top. Yum. You can substitute the eggplant for capsicum – whatever fits with your garden veg supply. Heat olive oil in a pan and saute the chopped onion for a few minutes. Add garlic, cumin, paprika, chopped tomato, eggplant and/or capsicum and allow to simmer 10-15 minutes until it has reduced a little. Add salt and pepper to taste. Crack eggs on top and cover the pan. Cook until your eggs are just how you like them. Garnish with fresh greens and enjoy!